American DJ has a toolchest of lighting innovations in store for those who visit its display at ProLight + Sound trade fair in Frankfurt, Germany March 24-27. The company will show two new additions to its popular Revo Series of LED moonflowers, unveil a ground-breaking moving head with revolutionary Philips 5R lamp technology, and take the wraps off one of its most unusual special effects ever – a clear, see-through fixture named after its look-alike fish! One of the stars of ADJ’s PLS lineup, the Jellyfish is a totally original LED effect with 84 RGBW lamps, housed in a unique-looking clear plastic case. Like its namesake fish, the Jellyfish radiates color through its transparent “outershell,” which makes it two effects in one: a bright red, green, blue and white beam projector; and a glowing case that changes colors. Unlike most fixtures that are best hidden away, the Jellyfish’s color-changing case actually becomes part of the light show! 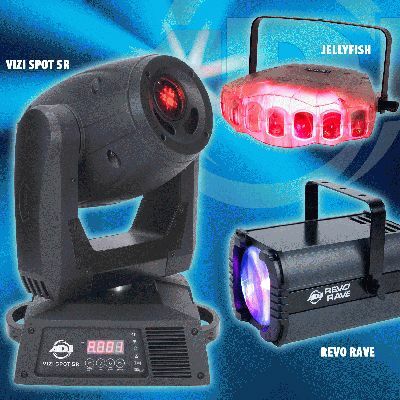 A DMX-compatible effect, the Jellyfish can also be run in Sound Active and Master/Slave modes, featuring high-energy built-in programs, a color strobe and 0-100% electronic dimming. Weighing just 5 lbs., it’s great for mobile use. Plus, with no moving parts and 100,000-hour-rated LED lamps, it’s virtually maintenance-free. Drawing just 13W of power, it may also be the world’s first “green” jellyfish! Another new ADJ light addresses the demand for smaller, more energy-efficient fixtures in a big way. The Vizi Spot 5R is a DMX moving head that blasts the output of a 575-watt unit, while being about ½ the size and using less than ½ the energy! What’s more, at just 27 lbs. it weighs about ½ as much as a typical 250-watt fixture, which also makes it much faster than most moving heads. How is this possible? The Vizi Spot 5R utilizes revolutionary new Philips 8000°K Platinum 5R discharge lamp technology, which in addition to delivering the above advantages, has an amazingly long discharge lamp life, rated at 2,000 hours. Despite its compact size, the Vizi Spot 5R is loaded with a full complement of professional features, including 7 dichroic colors, 8 rotating interchangeable gobos, 3-facet prism effect, gobo scrolling, gobo shake effect, 0-100% dimming and more. ADJ will also be revealing the newest members of its top-selling Revo family of high-energy RGBW LED moonflowers – the Revo 4 and Revo Rave. Like their siblings, both are ideal for DJs and clubs, producing a roomful of eye-popping red, green, blue and white beams, while being portable and easy-to-use in either DMX, Sound Active or Master/Slave modes. The Revo 4’s 256 5mm RGBW LEDs create distinctive high-tech box-like patterns --- matrixes, grids, squares and other geometric shapes. 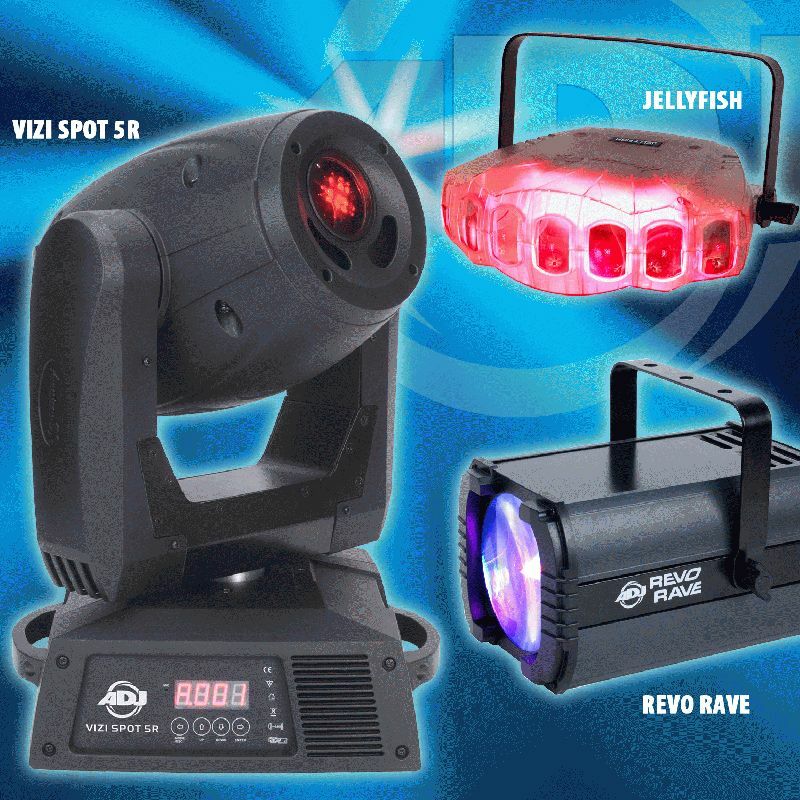 The Revo Rave is extremely compact with very wide beams, produced by 162 5 mm LEDs, which give it a lot of punch for its small size and make it great for entertainers on the go. Both units have a 100,000-hour lamp life and generate very little heat, so there’s no need for duty cycles. Plus, entertainers can pack up immediately after the show without waiting for a cool-down period. These and other innovative products can be seen at American DJ’s PLS exhibit, located in Hall 11, Booth D51. “If there’s one theme running through our PLS show display, it’s that American DJ is continuing our commitment to bring the latest, most advanced lighting technologies to our core customer group – DJs, clubs and mobile entertainers. Whether it’s LEDs or the new Philips Platinum 5R discharge lamp, we are incorporating these cutting-edge technologies into fixtures that are compact, reliable, easy-to-use and fit within our customers’ budgets,” said Scott Davies, General Manager of the American DJ Group. Personnel from American DJ and American DJ Europe will be on hand to demonstrate the company’s new lighting products. American DJ is exhibiting in Hall 11, Booth D51.